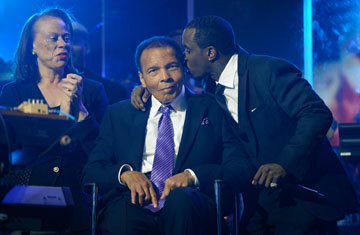 Lonnie Ali, boxing legend Muhammad Ali and recording artist Sean "Diddy" Combs appear onstage during the Keep Memory Alive foundation's "Power of Love Gala" celebrating Muhammad Ali's 70th birthday at the MGM Grand Garden Arena February 18, 2012 in Las Vegas, Nevada. There it was, arguably the world's most familiar face, in a frozen stare. He didn't say a word. He didn't have to. Muhammad Ali is at a point in his life where he really doesn't do very much. There was much ado around him in Las Vegas on Saturday. Celebrities came to honor him with speeches and performances. His friend Stevie Wonder had sung at Whitney Houston's funeral and then took a flight to Vegas to sing "Happy Birthday" for his friend. Snoop Dogg, Common, Cee Lo Green, Samuel L. Jackson, John Legend, Slash, David Beckham, and close to 2,000 other celebrities, friends, and the public were on hand Saturday night at the MGM Grand Garden Arena to be in the presence and honor the son of a Louisville, Kentucky billboard painter who had become a legend in the history of sports and social justice. Of late the tributes have been coming faster and more furious than an Ali shuffle. Perhaps because even living legends must bow to mortality  and the ailing Ali turned 70 on Jan. 17. Friends and fans would like to hang onto him forever. No one wants to say goodbye, not yet, to the Greatest of All Time, ravaged by but bravely enduring Parkinson's for 28 years. Ali, many confidantes whisper, has become more reclusive, more passive, of late, sitting in his Paradise Valley, Arizona home watching old films of his fights and doing his daily stretching exercises. Sometimes his face freezes and he looks frightened, like he is in the midst of a nightmare. But then he will start talking lucidly, for a few minutes, "like the old Ali," friends say. Or so they convince themselves. There was talk, around the time of his birthday, that Ali might not make it to Las Vegas for Saturday's event to raise money for the Cleveland Clinic's Lou Ruvo Center for Brain Health and his own Muhammad Ali Center. On Feb. 1 Angelo Dundee, Ali's beloved trainer, had died. Dundee was 90, but boxing writers called him constantly to get his thoughts about boxing and life. Up until the end, Dundee was still very lucid, and he still loved discussing his greatest pupil, Ali. He told me, a couple weeks before his death, "One of the greatest things that happened to the human race, [was] having Ali around." Ali traveled to Dundee's funeral in Florida and just sat there dazed, not saying a word, throughout the numerous eulogizes, and he didn't recognize some of his long-time friends. But despite mourning his mentor, Ali made it to Las Vegas. The Louisville Lip has always been a showman inside and outside the ring, and he has never been able to resist helping the less fortunate. Late Saturday night, the organizers of the "Muhammad Ali 70th Birthday Celebration Weekend" had yet to add up the money raised through the weekend's various fundraising activities, including an auction (Ali's gloves from his 1965 fight against Floyd Patterson, fetched $1.1 million; the winning bidder was Lorenzo Fertitta, owner of the Ultimate Fighting Championships), but Ali's presence, said Larry Ruvo, the event's founder, had taken brain health awareness and fundraising to "another level." (The gala will be broadcast on ABC and ESPN2 on Feb. 25.) Some of Ali's greatest foes attended the gala: George Foreman, Leon Spinks, Chuck Wepner, George Chuvalo, and Earnie Shavers. They were here for their friend, they said, but also to help raise awareness for the Lou Ruvo Center which is working on cures for cognitive disorders and conducting a landmark study on the brain health of professional fighters. Spinks, who upset Ali in 1978 and then lost to him seven months later, had his wife interpret for him as he signed autographs for fans because his words were so unintelligible. Ali sat, placidly, throughout the evening. Well dressed men and women approached his table, like children, to get a glimpse of him. A frozen stare creased his face as the night wore on  the People's Champion, on a perch in Purgatory. Time has not been kind to Ali's health, but it has been widely accepting of his once controversial ideals. A generation who were inspired by him, from singer Sean Combs to the fighter Evander Holyfield, were on hand Saturday night in Las Vegas to proclaim that he made them believe that anything was possible in life. His charisma and courage inside and outside the ring have made him universally acclaimed; his face, no matter its frozen expression, still the most recognizable in the world. On Saturday, The Greatest did not address the crowd. Nearing midnight, they brought him on stage, guiding him carefully as he slowly shuffled. As Stevie Wonder sang Happy Birthday and red and white confetti fell on the stage, Ali would look up and down, his once expressive eyes not revealing very much. The crowd chanted his name. ALI! ALI! He appeared to enjoy the sound. Just to see him up there on the stage, hopefully enjoying himself, The Greatest of All Time. That's all anyone could hope for.